Adelaide’s Marion Hotel has revealed progress partway through their $20 million renovations. 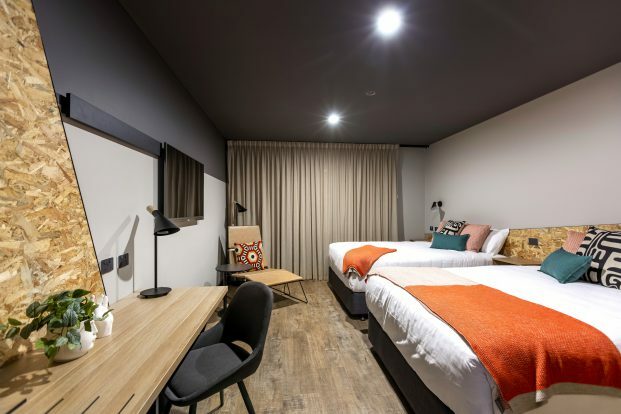 A major renovation in Adelaide’s south has passed a significant milestone as publican Jenny Hurley reveals the look and feel of their new accommodation rooms. The $20 million dollar project has already launched the new The Shed Sports Bar and associated function area in July of last year, along with a new three-lane drive through and cellars along with the new kitchen, all launched in December 2018. The first refurbishment in 20 years, now the Marion Hotel is on the brink of opening the new garden bar, gaming room and lobby in early June. Ultimately the project will deliver 62 accommodation rooms in mid-July, 50 more than previously, and looks to reposition the hotel as a compelling function venue, particularly weddings. “We have seen demand for not only accommodation in the area but also increased demand for function and retail space,” says owner Jenny Hurley of the Hurley Group. Just the hotel’s second owner-operator in over 50 years, the Hurley Group will open the restaurant, function rooms and function garden at the end of August 2019. Renovations begain in June last year and all spaces should complete in August 2019, creating over 40 new jobs, at the expense of a reduced footprint for the old Front Bar. Hurley Group’s Jenny and Peter have owned the hotel since 1984 and say the new bedrooms will have tailored furnishings and recycled materials reflecting a blend of traditional and modern elements. “The rooms are sophisticated spaces where industrial chic meets luxury,” says Hurley, “boasting creative flare, the new guest rooms have been crafted with tailored furnishings and unusual fixtures made from unique or recycled materials. The rooms are a blend of modern and traditional design, [creating] a calm and relaxed space – the perfect ‘home away from home’ “. A new garden bar, dining and function area and intimate gaming room will round off the project. “We are proud South Australians with a passion for local designers, many interiors and finishes have been sourced from local and Australian suppliers” says Hurley, as she reveals a new menu will launch later in the year. “[We]will not stick to a specific cuisine but have hints, inspirations and flavours from around the world. On the menu you will find smoked food, dishes to share and the occasional quirky ingredient – bold, full of flavour yet appealing for the everyday diner. With health and well-being a focal point, there will be plenty of healthy choices – including gluten free, vegan and vegetarian options,” says Hurley.